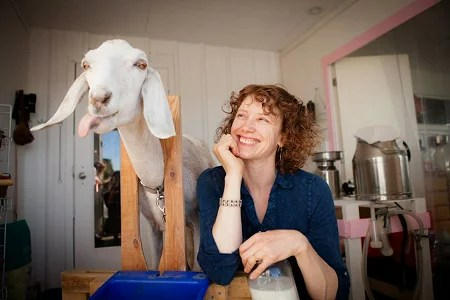 Milk and Honey Soaps Founder CEO and Milkmaid Daven Lee, was today’s guest on the Yarn Thing podcast with Marly Bird. Daven’s foray into the world of knitting began when her child was an infant, so little that her hands were free enough to knit. When she took her first sweater for her baby to the knitting store, the woman there tried to put it over her own head! She discovered that she was not going to be able to put the sweater on her baby, and thus ‘So you knit, so shall you rip!’ She was undaunted, though, the next piece she cast on was from Debbie Bliss, and she has worked through other techniques, recalling her hesitation over knitting socks. Daven found inspiration for creativity in her knitting group. Once they decided to try soap-making. Experimenting with soap molds and goats milk from her own goats and lotion bars, she fell in love with her beautiful creations. She continued tweaking the recipes and had custom molds made. And her business Milk + Honey was begun. One of the things that Daven takes pride in is using essential oils for scent, rather than man-made scents, as they are derived naturally. She began with Lavender as a classic scent and grows abundantly around her home in Sante Fe. It also calms and when used on your feet helps you rest easier. Her scents now include Lemongrass, Citrus and a blend of Lavender and Rosemary. There is also an Unscented choice which has a slight fragrance from the natural beeswax that she uses, based on the season it’s harvested. You can find all of her products at the website, by clicking the pretty logo above or going to this link: http://milkandhoneysoap.com/ We would recommend bookmarking it. There is also a Ravelry group for knitting fans who love this company: http://www.ravelry.com/groups/milkhoney There was a pretty good discussion about gifts with today’s program. Great gifts for knitters and some thoughtful gifts for the men in our lives included. I love having smooth skin and hands. I think that the Milk and Honey lotion bar sounds really interesting and I want to give it a try. The natural ingredients and scented oils used by milkandhoney.com’s products just sooth away the stresses from a long days yarn shopping! I’m sure the Milk and Honey products are very soothing to the skin. I’ll have to give them a try. I find crochet soothing and knitting a bit of a stressor, yet. It would be lovely to have some lavender lotion bars in my kit for that moment when my knitting turns into…knoting! I think the Milk and Honey products would soothe my hands and also soothe my soul. Can’t wait to try. Now I know what I will give for holiday gifts… Sharing the soothing lotion with friends. I can’t wait to try a lotion bar to soothe my hands this winter in Nebraska. My favorite design is the sweet nursing baby. I also love that the products are all natural! Soothing Milk and Honey lotion sounds wonderful. I would love to try it in my very dry climate. Great interview. Thanks. I love the idea of both the soap and plotion bars. I have many allergies and finding a product that is soothing to the skin with scents that won’t bother me is heaven. I’m intrigued about the soothing properties of the lotion bars. I love the idea of the essential oils as fragrance. Thanks for the podcast! I love using handmade lotion bars and soaps. The scents are lovely. I love to rub the lotion on my feet right before bed. It helps to soothe me and help me relax for sleep. Another lovely item to become addicted too! I think the lavender and rosemary would be soothing and smell heavenly. I put these on my Christmas list! I would love to soothe my hands with one of the lotion bars. Lemongrass or lavender sound like they would be my favorites! The lotion bars sound like they would soothe my feet that crack so horrible in the winter!!! What a great interview! Oh the sound of a Marly laugh is soothing to the soul. I am sure your uber cool bees lotion bars would be soothing to my so dry that they crack and itch hands 🙂 Crossing my dry fingers in hopes the scroll arrow lands on me. I have used lotion bars in the past and they have been so soothing to my dry winter skin. I can’t wait to try Milk + Honey’s lotion bar!! With the cold weather here now my skin is all kinds of dry and itchy. A lotion bar sounds perfect to soothe the irritation. I am intrigued by your story and will be checking out your products. Thanks! Can’t wait to try this. Always looking for something to soothe my hands and feet, especially now that winter is setting in! Great show, great product! Living in the northeast definitely leads to rough skin. The lotion bars sound nice and soothing and perfect gifts for all my crochet friends! A little soothsayer told me he saw a solution for my cracked knuckles in the future. Really? Could I even hope to have my poor knuckles smoothed and soothed? “Yes”, he said. I had only to apply a soothing Milk & Honey lotion bar. Soothsayers can do more than tell you the future …………………. They can tell you how to sooth. Thank you for another great episode, Marly! I live in Colorado, too, so I can relate to how dry it is here. My hands get so dry they split and crack especially this time of year and it can be really painful–way worse than a paper cut. I can’t wait to try a lotion bar to soothe my super dry hands. My husband and I try to use as many natural products as we can so I love that the Milk and Honey bars are all natural. I’m working with a crunchy 100% wool so the soothing properties of Milk and Honey will be a great thing. Thanks for the info on this great product.